My sister Mary has been visiting Kew Gardens and with a guest picture like this, who can blame her? Our spell of good weather is rapidly receding in the memory and we are back to ‘business as usual’ – grey skies, brisk winds and occasional rain. Still, the first part of the day was forecast to be the least windiest so I got out on my bike after an early breakfast and did twenty miles and was home in time for coffee. It was quite strenuous as I did nearly as much climbing in my twenty miles today as I did in Monday’s fifty miles. I creaked alarmingly but got home safely. …and the camera played its usual trick of focussing on the dull background more clearly that the colourful intended subject. I should have taken more pictures just in case this happened. 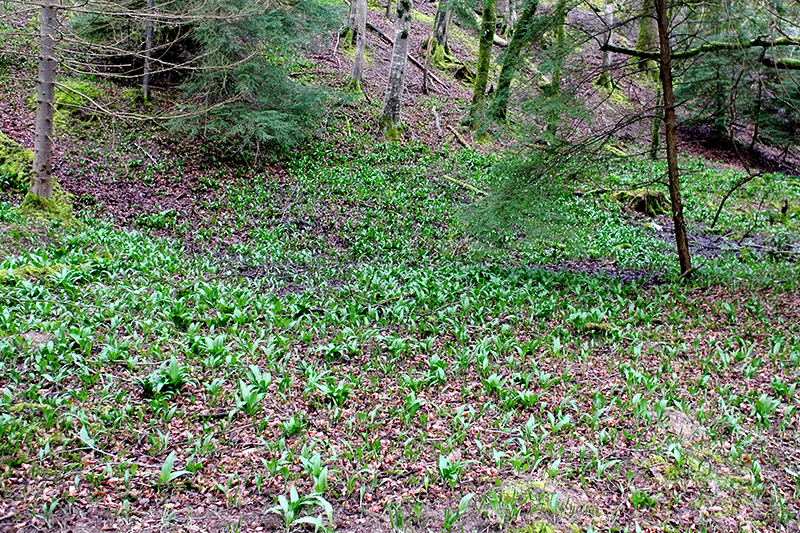 On my way home, I passed a superb bank of wild garlic near Waterbeck…. …and several examples of Jack by the Hedge or garlic mustard a bit further along the road. I have passed this little glen at Falford many times but I don’t think that I have ever seen it looking better than today in spite of the grey weather. As forecast, the wind got a little stronger as time went by and thanks to sound route choice, I got blown home in a very helpful way. When I got back, I shifted a little of Mrs Tootlepedal’s manure heap and put some buck-u-uppo on the middle lawn in an effort to encourage more grass among the moss. I had a look round too. We have dead headed the vast majority of the daffodils now and only a few remain. 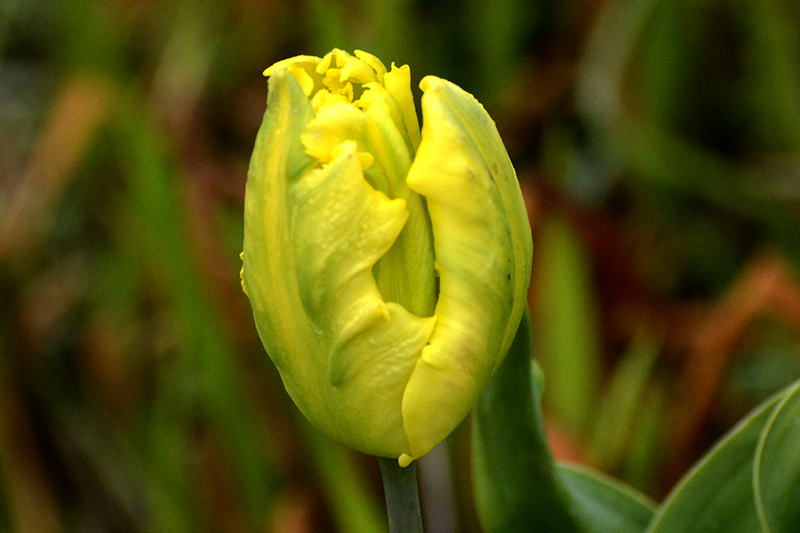 This one was my daffodil of the day today. ..which are gently unfurling in the back border. There is a smaller fern growing between the stones behind the pond. There are other things going on. We are getting very excited by the development of the azaleas. A bergenia is hiding its light under a bushel. 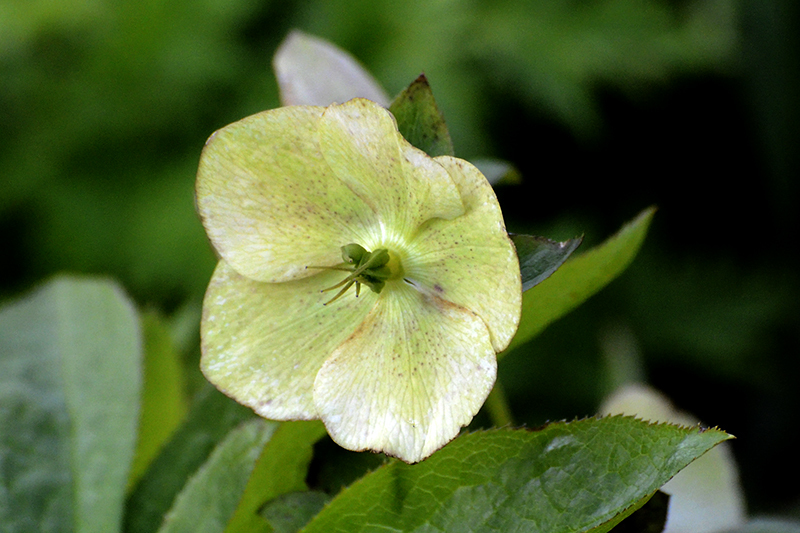 An alpine clematis is flowering modestly. And the river of grape hyacinths is still flowing. I didn’t have much time to watch birds today but I was pleased to get my first sighting of a baby blackbird today before I went out cycling. Ironically the baby is the larger looking of the two birds. I saw the mother again later. The birds are making a mess of the lawns. Both blackbirds and jackdaws are busy digging things up. …but I caught one at it later in the day. 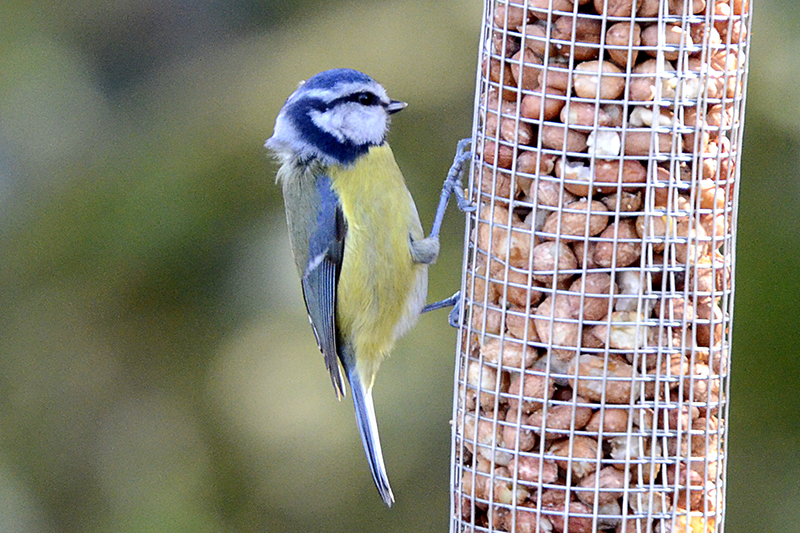 There was plenty of seed eating on the feeder today, perhaps because there wasn’t so much gardening being done on account of the gloomy weather. The birds didn’t look very grateful though. I made some soup for lunch and then a persistent rain started which lasted on and off for the rest of the day. I found a dry moment to walk up to the garage to collect the car. Mrs Tootlepedal had dropped it off there while I was cycling as we have decided that it is time to take the winter tyres off and have the summer ones put on. Surely it can’t snow at this time of year……can it? We put the afternoon to good use by doing the sort of tasks that need a wet day to get done and then we were cheered up by a visit for a cup of tea of not just Mike Tinker but by Scott, the minister too. 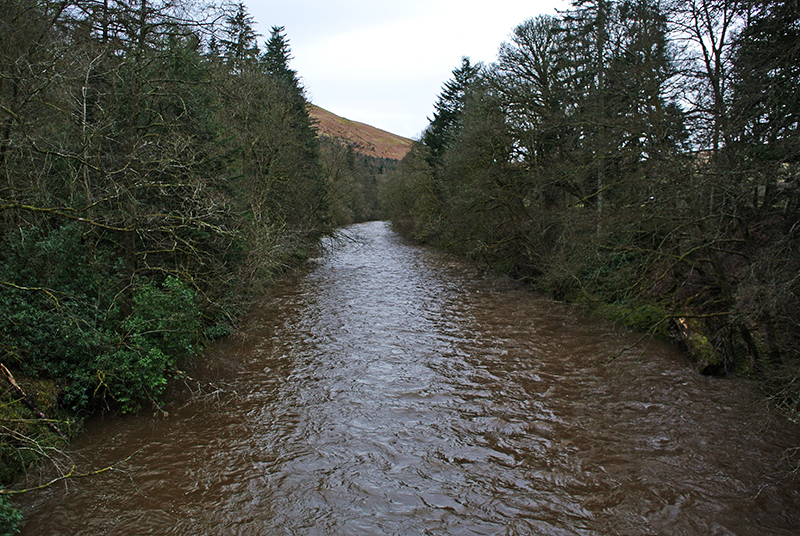 In the evening, I walked through the rain for the weekly practice of Langholm Sings where I sang several notes that were in the right place and at the right time. Some of my other notes were not quite so accurate. Home practice needed. 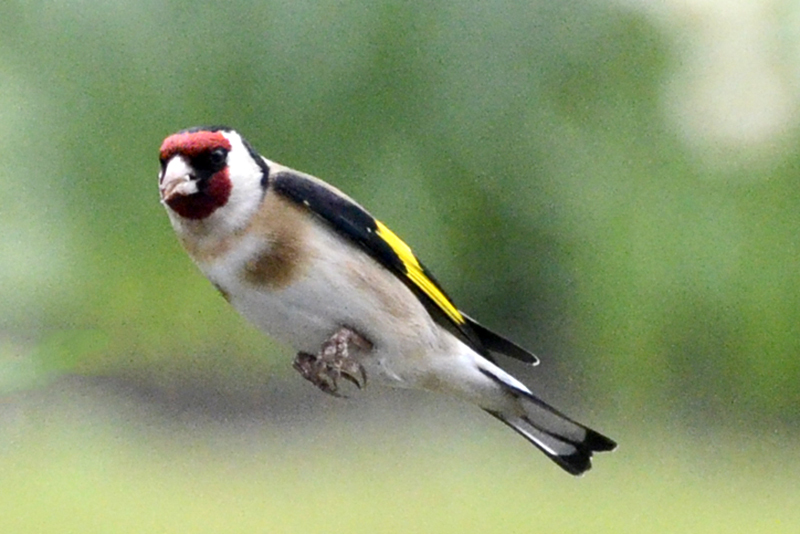 The flying bird of the day is a goldfinch supervising traffic at the feeder. Today’s guest picture comes from my brother Andrew who appears to be spending May Day in Madrid. He visited El Parque de Buen Retiro where he admired the colossal statue of Alfonse XIII, best viewed from across the boating lake. After putting on a good show for the visit of Mary Jo yesterday, the local weather gods fell back exhausted today and we reverted to mostly grey skies, a very cold wind and rain later. It didn’t matter all that much to me but Mrs Tootlepedal has got very fed with gardening in the cold. She had woken up early and done quite a bit of good work in the garden before breakfast and then after breakfast, she decided to drive to the council dump, 18 miles away to get rid of the old vegetable bed boards, the old bench and sundry other items. I had woken up with a very tender and arthritic thumb with a considerably swollen right hand so my plan was to let Mrs Tootlepedal do any work that was going and to try to rest the hand as much as possible. 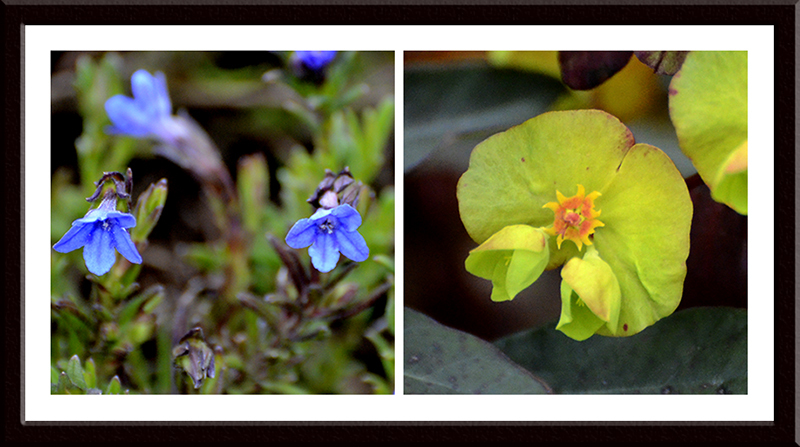 While she went off to the dump, I took a very gentle walk with my pocket camera clasped in my left hand. Even with the light camera, taking pictures was not easy. 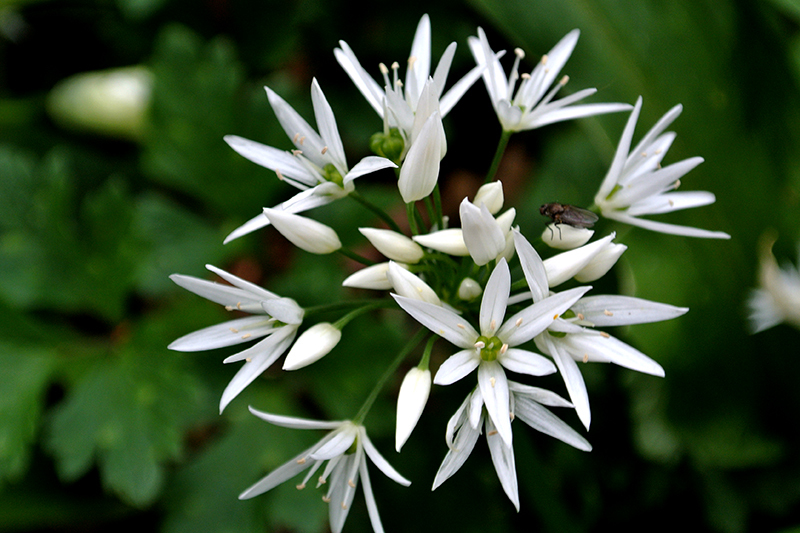 I had hoped that the bluebells might be out so I walked along the river past great banks of wild garlic, just about to burst into flower…. …but it has been too cold and not sunny enough so when I got to my preferred bluebell spot, only a few were showing and the path up through the woods was still waiting for the blue carpet to be rolled out. I walked up the path all the same and enjoyed what there was to be seen along the top. Views over the town are disappearing behind fresh leaves. When I got to the Stubholm, I continued along Gaskell’s Walk with just a hint in the blue sky above Meikleholm Hill to cheer the day up. The path through the young birches was at its most magical. There were a lot of grasses coming into flower along the path. 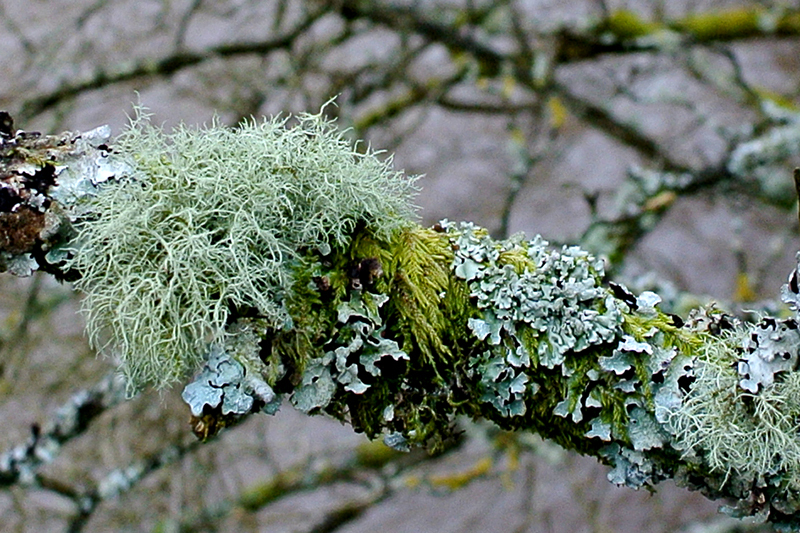 When I got to the Auld Stane Brig, I stopped to look at the permanent little lichen forest that grows on the fence post beside the bridge. At only a little over an inch high, it stubbornly resists rain, snow, hail, wind and the road of passing traffic. Further along the road some of the hedge was full of different lichens. 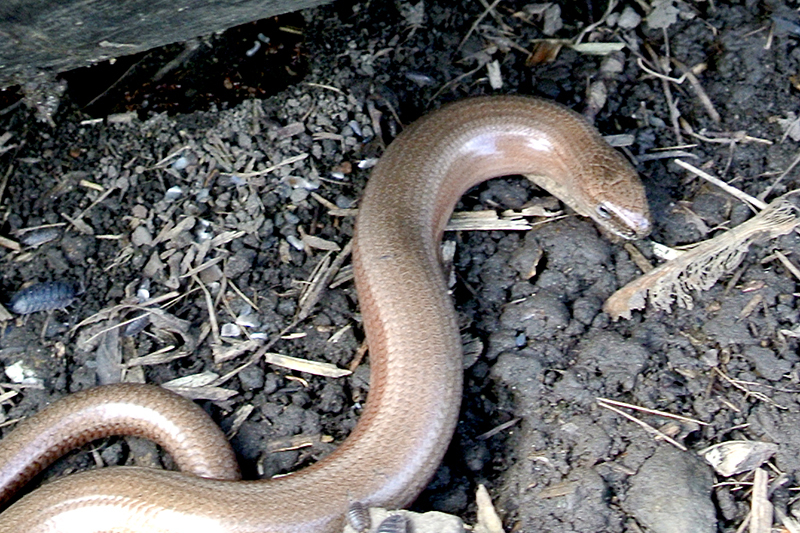 …and on the wall at Pool Corner there was enough heat under the shelter for the slow worms to have come out. They like to snooze in a heap. …and she, with a little help from me, gave the car a good clean up, even going as far as getting the vacuum cleaner on to the job. ..and I went off to look at some more. 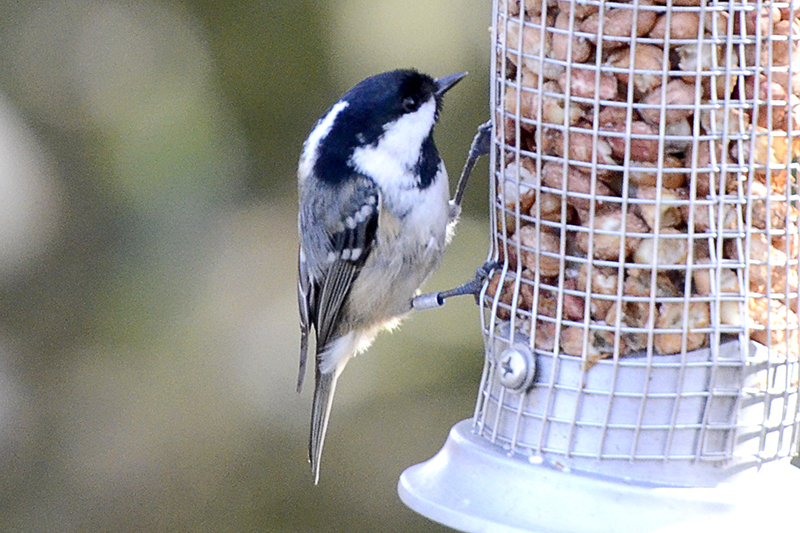 I couldn’t hold the big camera up or get the tripod into position so there are no bird feeder pictures today. I did take a picture of the chimney pot underneath the feeder though…. That concluded my activity for the day and I spent the rest of the day sitting down reading the papers or working at the computer, typing carefully with gentle fingers and holding the mouse in the loosest possible grip. As it started to rain heavily, this was no great hardship. I did take one more picture of some flowers in a vase on the kitchen table with Mrs Tootlepedal kindly holding up one of her scarves to make a background. The quiet day certainly did my swollen hand no harm and I may need to look after it again tomorrow as I have learned that my new bike might be ready for collection on Friday and I shall want to be in as good condition as possible for a test ride. There being no flying bird of the day, I have put in standing still and swimming ducks of the day instead, shot in a sunny moment on my walk. Mary Jo kindly sent me a picture of an old man she saw at the blogging computer in our front room yesterday. I don’t know who he is. He looks much older than me. Today’s springlike guest picture comes from Sandy, which is to say that I stole it from him when he wasn’t looking. I did see Sandy himself though when he came round for a cup of coffee after filling the Moorland bird feeders. He has been doing a lot of gardening lately and took advantage of the situation to have a conference with Mrs Tootlepedal. I should have been cycling as my mileage for May is very poor but we were waiting for an engineer to come and give our gas boiler its annual check so I used that as an excuse for not going anywhere. I was a bit rude about the weather forecasters yesterday so it is only fair to point out that they said it would be fine in the morning and start to rain at two o’clock today and they were absolutely right to within five minutes. I used the dry but overcast morning to mow the front lawn, the middle lawn and the grass round the greenhouse and was pleased to see that the newly sharpened mower was cutting a bit better. 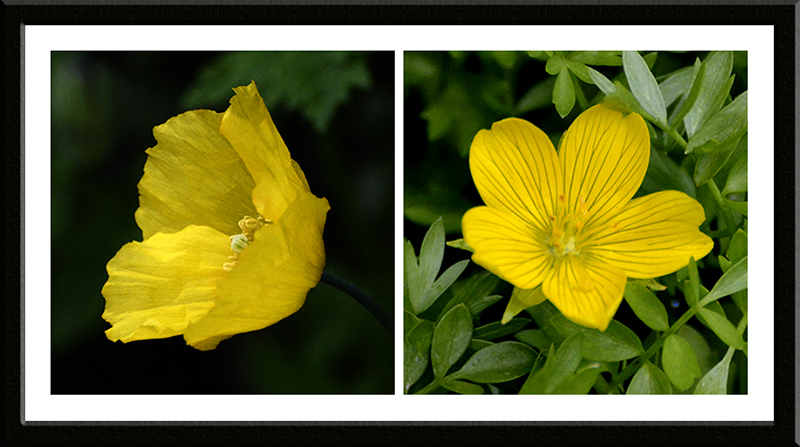 I also took the camera round the garden. My daughter has complained that in my pursuit of striking flower pictures, I don’t show enough general pictures to convey what the garden actually looks like. This is a fair point but we are in a state of floral pause at the moment and the general picture is quite dull. I will be looking for colourful corners quite soon. In the meantime here are some individual promises of better things to come. After lunch, I was working away at my computer because I have finally been bullied by Microsoft into upgrading to Windows 10 and there are differences to the filing system for pictures which are giving me some grief when Mike Tinker popped in. When I went out into the garden with him, it had almost stopped raining so when he left, I decided that a short walk would perk me up and I put my coat on. By the time that I got out of the house, it had started to rain again so I picked up a stout umbrella and went off regardless. After a dull half mile pushing up the road into the wind and rain, I turned onto Gaskell’s Walk and with the wind and rain behind me, the rest of the walk was very pleasant. It wasn’t really a day for taking pictures but I poked my lens out under the umbrella from time to time because it was a beautiful stroll in spite of the conditions. 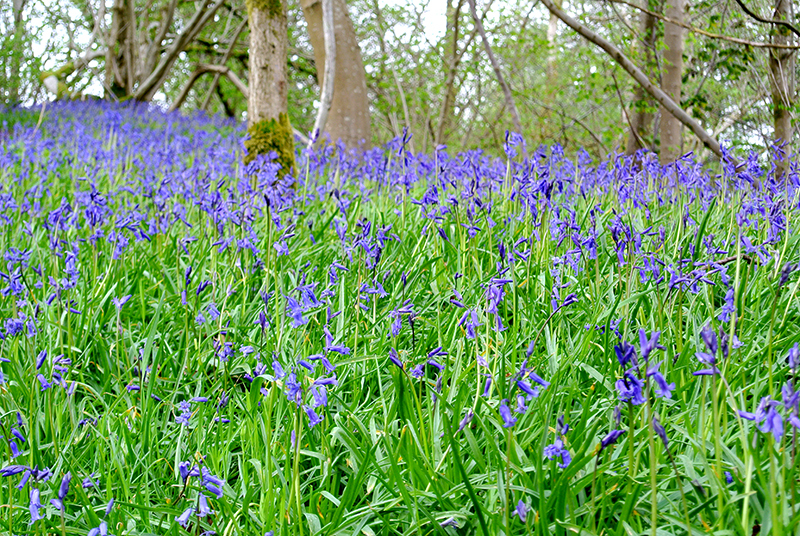 Not long ago, Gaskells Walk ran through a dark and flowerless conifer plantation but these trees were cut down and the bluebells which had been lurking underground for many years have seized their chance and the walk is now lined with them. There were wild flowers in abundance. …and I was pleased to see some red campion among the bluebells. 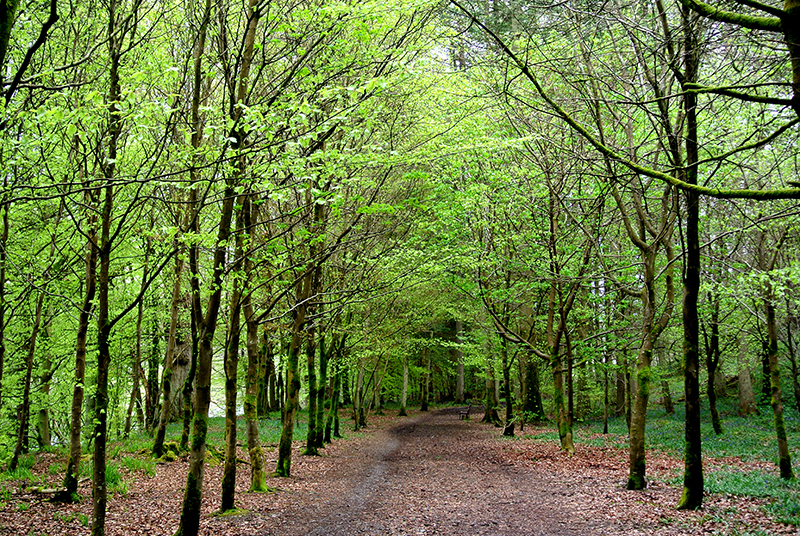 I walked along the track down towards the Murtholm and the bluebells defied the gloomy weather. They look as good individually as they do en masse. My umbrella did its job very well and the temperature was kind enough to make my damp walk a real treat. 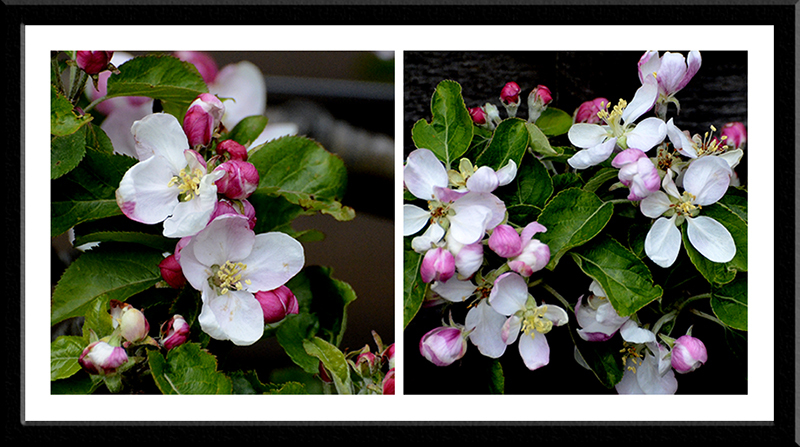 A little rain brings out the fresh spell of spring to add to the colours. It really is that colour. I haven’t Photoshopped it. …I headed home for a cup of tea and a dainty biscuit and settled back down to try to get to grips with Windows 10. At least I can find my files and all my programs work so I am reasonably content. In the evening, I went off to Carlisle with Susan to play with our recorder group and we enjoyed a good selection of music dug out from his vast collection by our librarian Roy. It is very good to be able to play music with old friends without any of the pressure of preparing for public performance but just for the pleasure of hearing and appreciating the music itself. 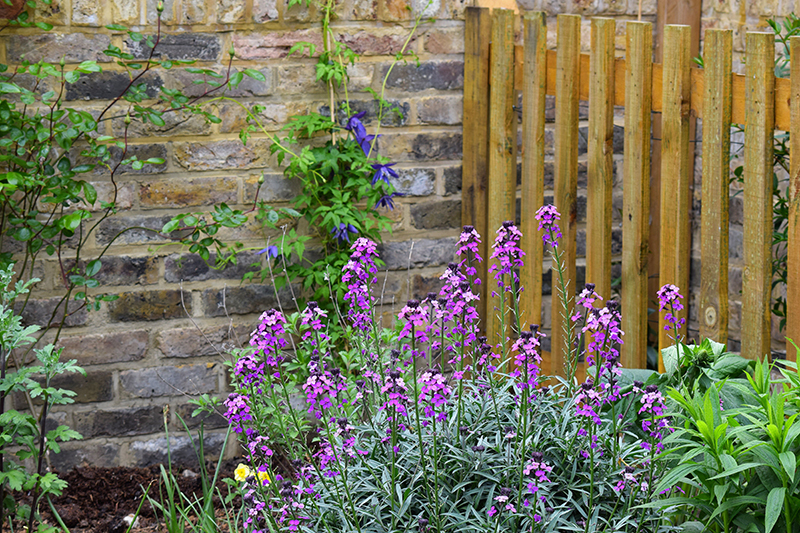 Today’s guest picture shows a colourful corner of my daughter’s garden on Monday. As she is in Cannes at the moment, it is having to get on without her. I personally had a very quiet day in contrast to the loud and windy weather outside. After a night of rain, it was at least dry, although we only got very infrequent moments of sunshine. I put a dull day to good use by doing some vacuuming, dusting and window cleaning. Now that the front room is watertight, we are trying to make sure it is well looked after. I also made some soup, mowed the grass round the green house and on the drying green and put a week of the newspaper index into the database so although I didn’t work up any great speed at any time, at least I was generally employed usefully for once. 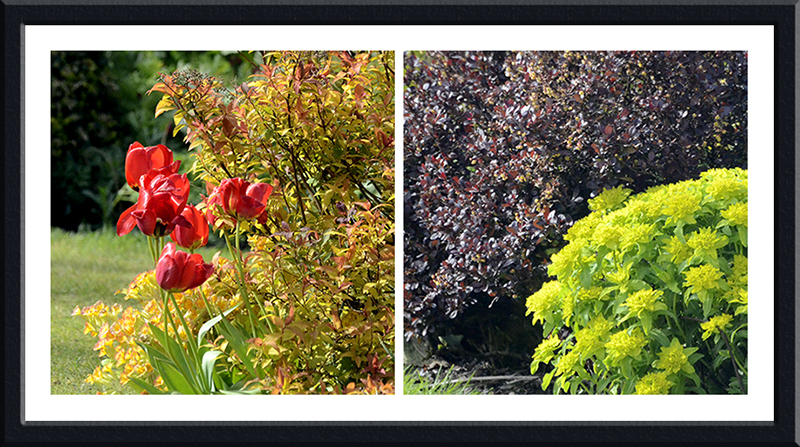 In between times, instead of staring out of the kitchen window, I walked round the garden once or twice. Things were rather yellow today. 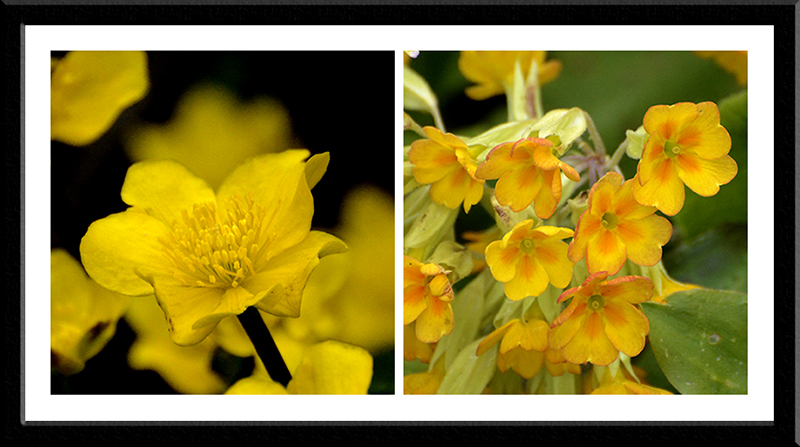 But the most striking flower was yellow. Mrs Tootlepedal, stopped tidying up inside after lunch and started to to some tidying up in the garden instead. She showed me an interesting looking thing. 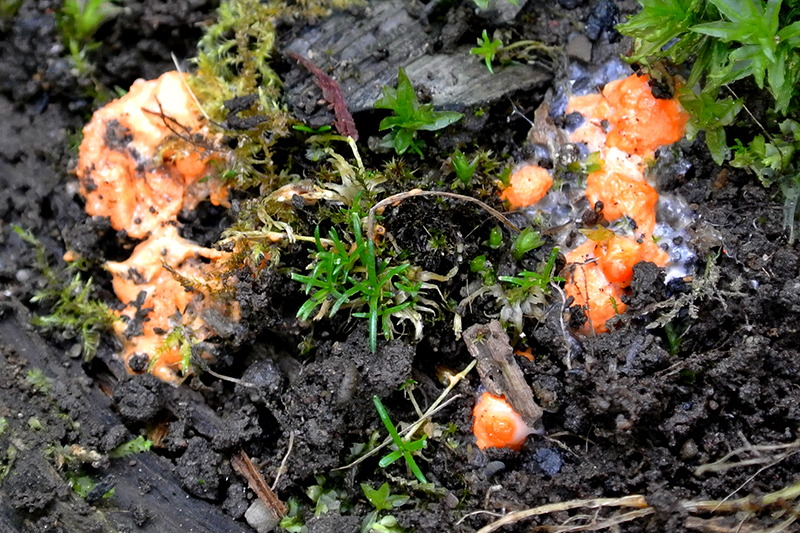 We think it might be a slime mold. In spite of the threat of rain, I went for a walk in the second part of the afternoon. 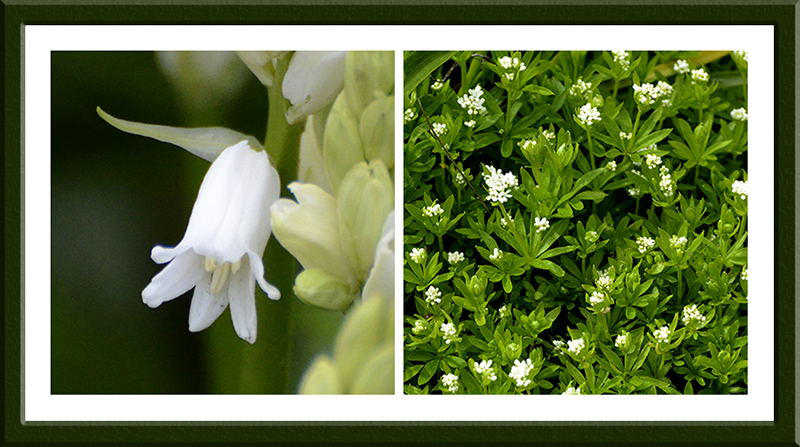 I was in search of garlic and bluebells. There was garlic…. 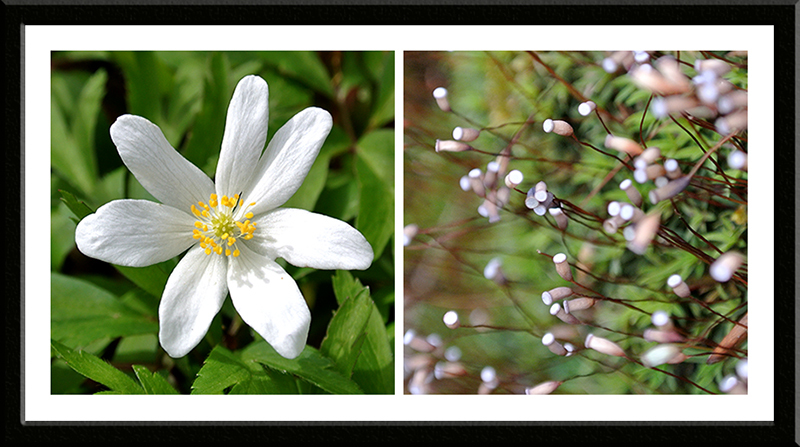 …and there was much to please the eye along the way, both in the way of wild flowers and mosses. 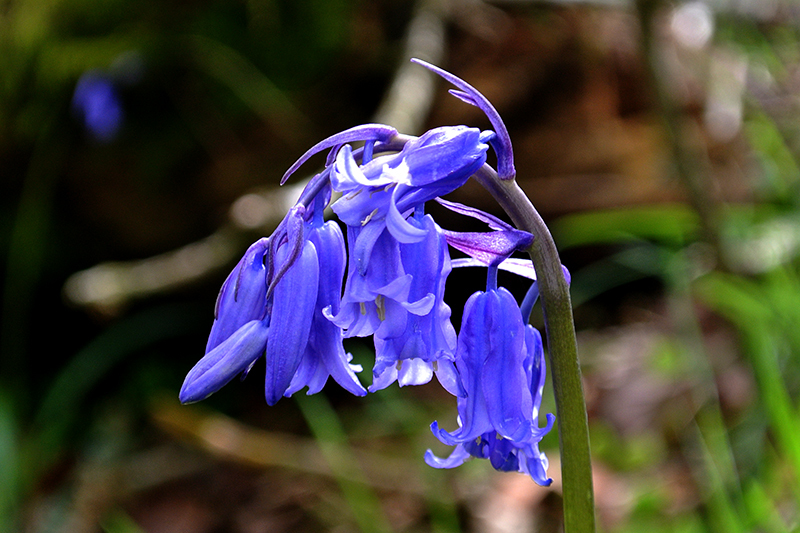 There were bluebells here and there wherever I walked…. Some of them were being visited by very orange coloured bees but I couldn’t get one to stop long enough for a picture. 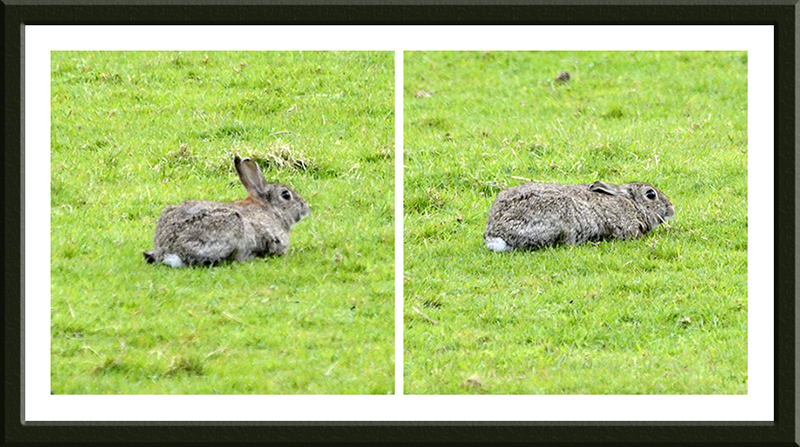 I thoroughly enjoyed a rabbit giving a living example of lying low. It saw me and having decided that I was between it and safety, it just sat very still indeed and hoped that I would go away. I went away so its scheme worked. 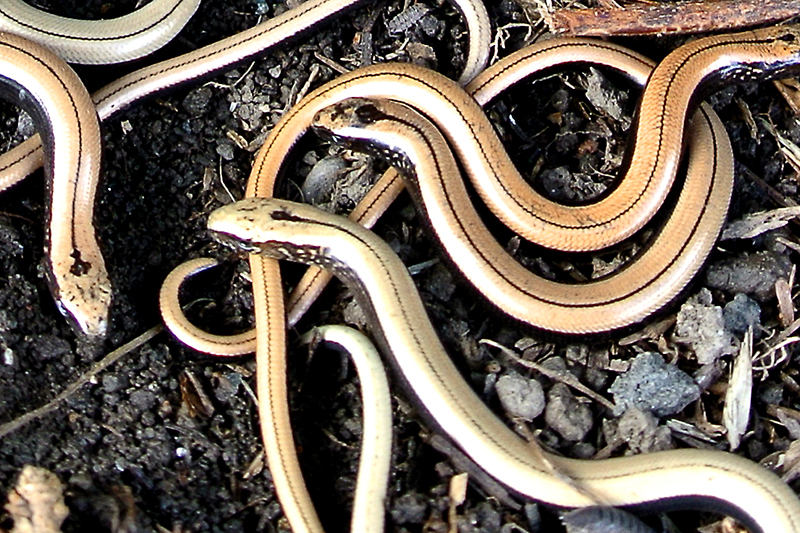 At Pool Corner, near the end of my walk, I checked up on the slow worm shelters. There were lots of little ones. And one big one. When I got back home, Mrs Tootlepedal had been at work in the garden but had been driven inside by the nagging, inhospitable wind. 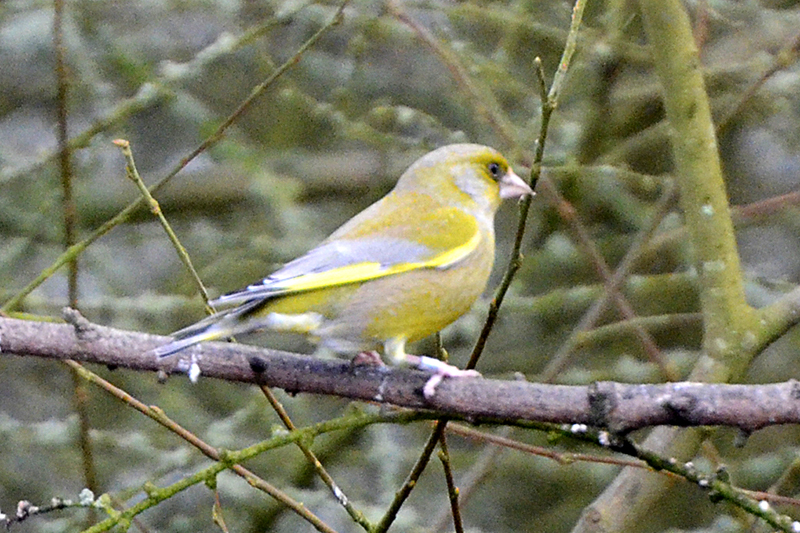 I enjoyed a cup of tea and looked out of the window at some nice colour combinations instead of my usual birds. I did see a bird or two as well. 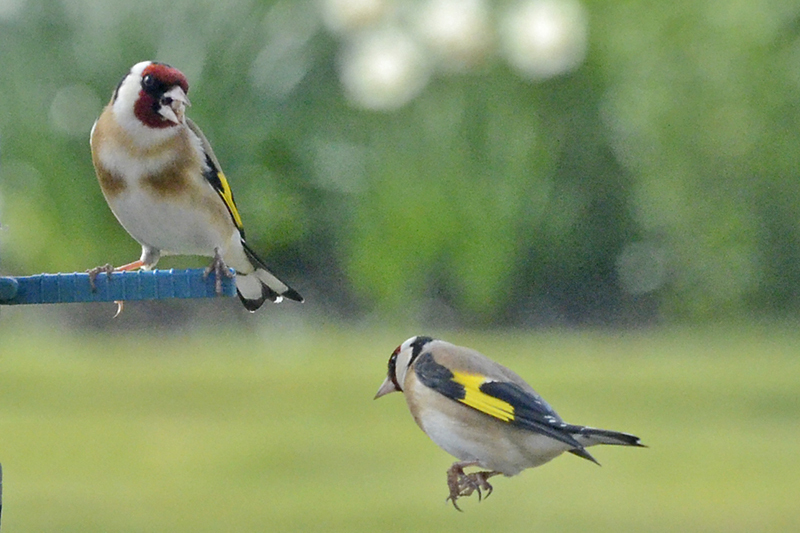 The goldfinches were still going on at each other. Near the feeder, Mrs Tootlepedal has put in a hellebore which seems to be enjoying life in spite of the wet and windy weather. 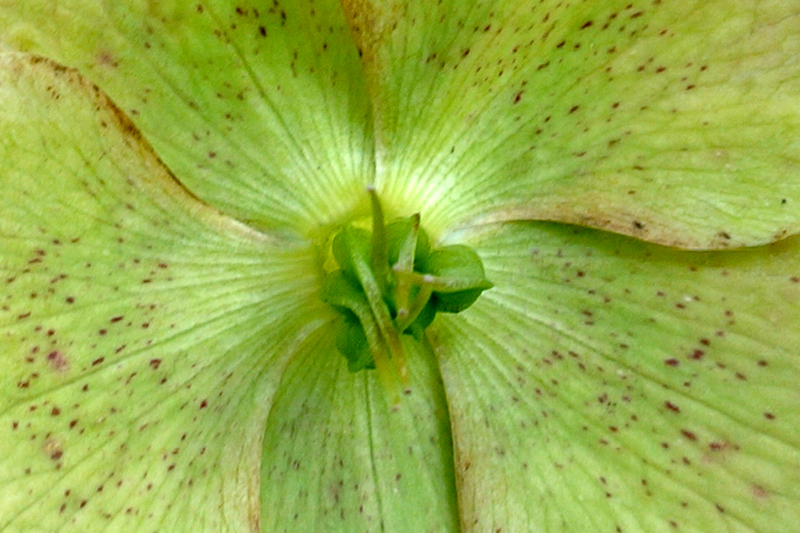 It is not the world’s most exciting flower but it repays closer inspection. In the evening, my flute pupil Luke came. His mother came too and asked if we would like to play a few simple duets at a musical evening at The Hub at the end of the month. We boldly said that we would so we will have to practice hard. 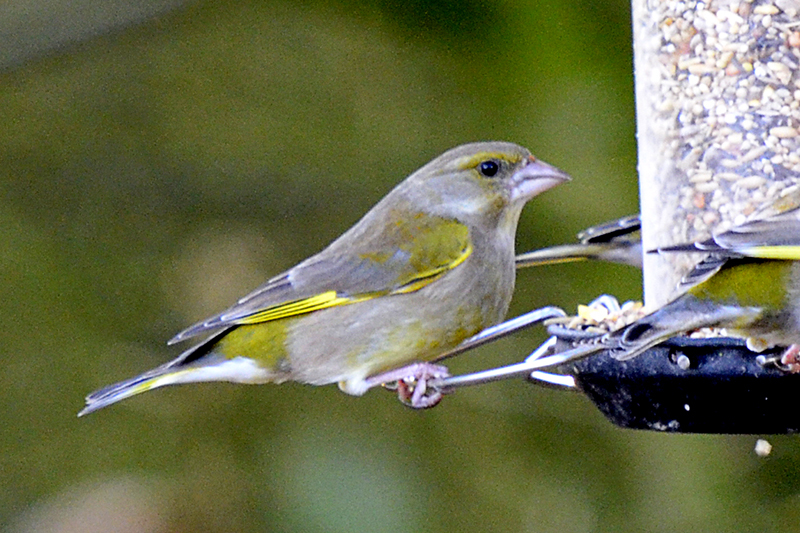 After yesterday’s fine display of wing feathers, the birds were keeping themselves to themselves to day and so we have a wingless flying goldfinch of the day. Today’s guest picture was sent to me by my son Anthony. 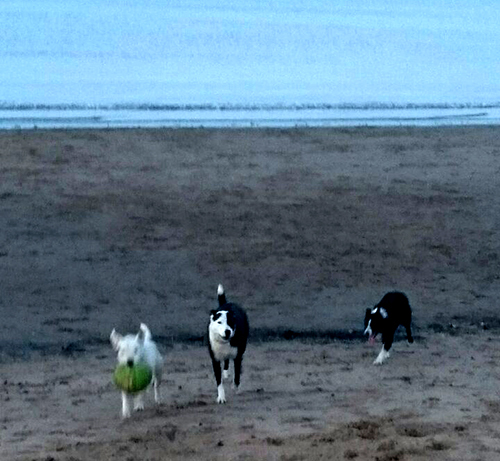 It shows his dogs scampering about on Portobello beach on the shores of the Firth of Forth. The dog on the left must have been going a lot faster than the dog on the middle to be so out of focus. After a night of heavy rain and strong winds, we were more than pleased to find no signs of dampness in the front room. Long may this continue. On a less happy note, we had to drive down to the people who sold us our new multi fuel stove. I didn’t put this in the blog at the time because it was so annoying that I was speechless but when we lit it last week, it only took half an hour for the glass in the door to crack terminally. This turned out to be caused by over-tightening of the holding screws by the supplier so a new one was provided. While we were down that way, we visited a handy garden centre and brought some expensive goods from their fancy food hall. As this included some very tasty cheese, the journey was wasted. We lit the stove when we got back and on this occasion the glass did not crack. We are encouraged. It certainly heats the room up well. It had been a very gloomy and wet morning but things brightened up a bit after lunch so Mrs Tootlepedal and I went up to the new hide at the Moorland feeders. While I looked at small birds in the trees, Mrs Tootlepedal sat in the car and scanned the sky for hen harriers. She saw a female very close to and came to tell me about it (after it had gone). I made do with some local residents. 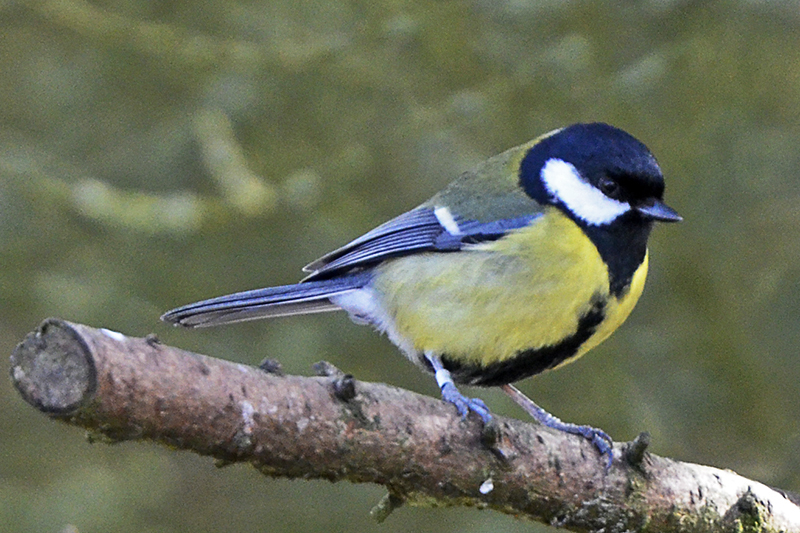 The sharp eyed will have noticed that all the birds so far have been ringed. There were some others which had not been netted so far. There are now some handsome benches in the new hide and handy shelves for a thermos (had I thought to bring one). We were just having a cup of tea when we got home when Sandy arrived. After the cup that cheers, Sandy and I went off for a brief walk. It was brief because the light was already fading and rain threatened. …and soon the familiar smell will be all pervasive on this walk. …in contrast to the low levels of the past week. I kept an eye out or tree borne lichen. 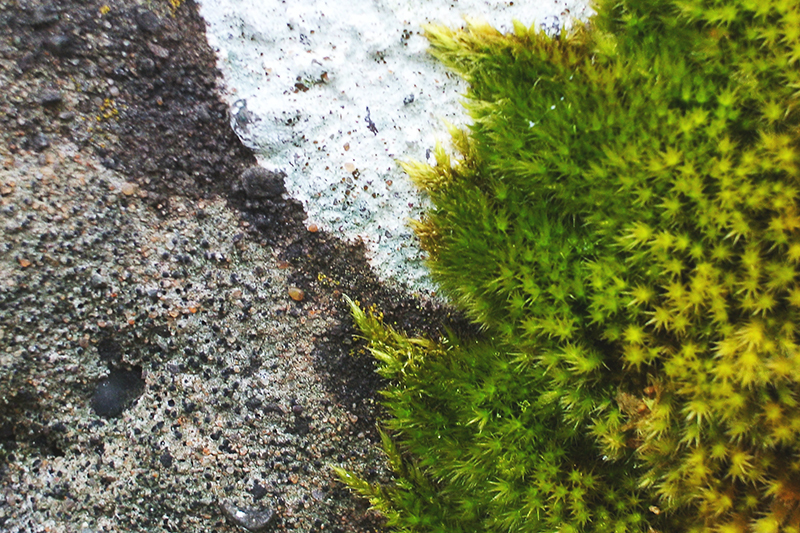 …but took a shot of a mossy wall in the name of balance. 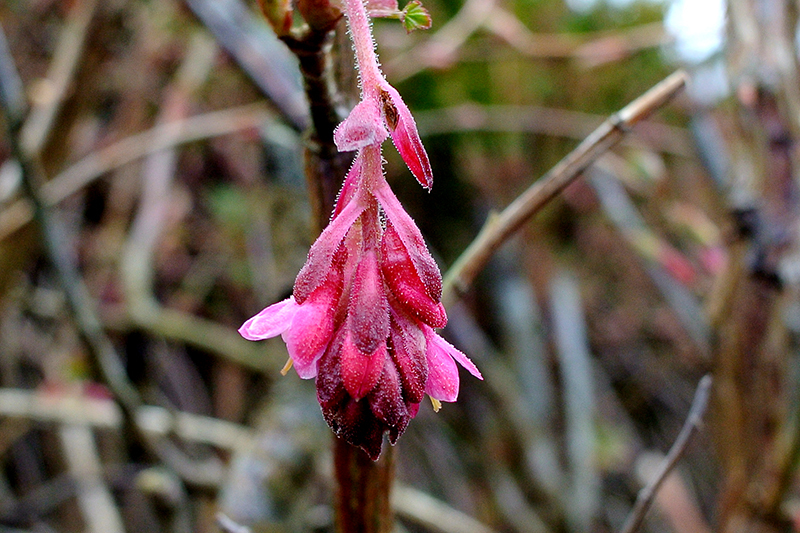 A dash of colour in our next door neighbour’s garden alerted me to the first flowering currant of the year. We got back to our respective homes without getting wet and I settled down to some serious resting. As my recent cycle outings have left my knew nee a little puffy, I was pleased to have the excuse of some very strong winds and rain to keep me off the bike for this weekend. I am not so happy to see that the strong winds are forecast to last for most of next week too. 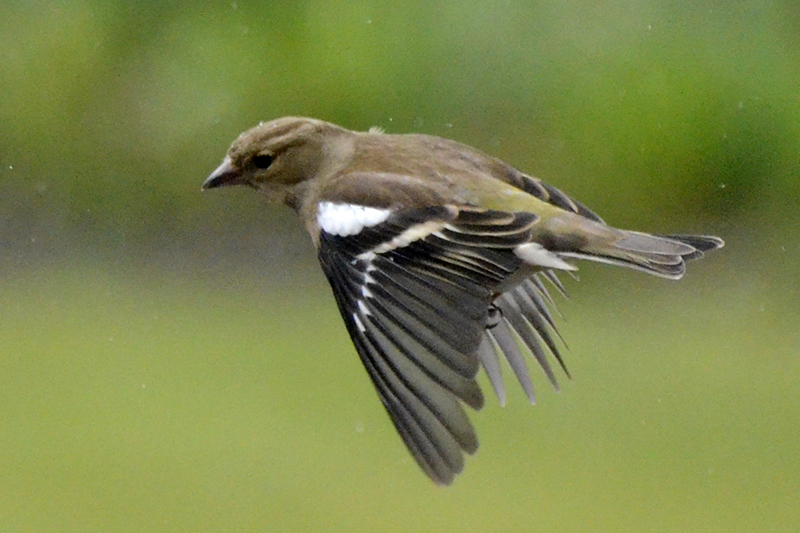 I did manage to find one flying chaffinch in the morning drizzle.